I have always given my heart to the kind of poetry which is completely and hopelessly emotional, like the work of Lorca or Neruda. When reading a poem, I am not so much trying to relate and connect with it intellectually but only from the heart. I don’t care if the poet has used the language like a fine tool or if the poetry can academically sound amazing, but I care more as to how I am touched by it and if it has the ability to affect me in real, deep levels, sort of like if the poem I am reading is inviting me to its house and sits with me at its kitchen table or I if am invited by it to its formal dinng room. Mary Oliver’s essays invite me to her formal dining room. It is indeed a very nice room. At times, it feels a bit cold, but still, it is pleasant to come to for a visit. 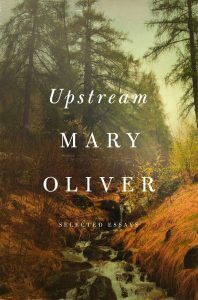 At 82 years of age, her autobiographical writings in her new book, Upstream, are gentle but strong, poetically furnished with the kind of wisdom which only comes with age. She was only 28 years of age when her first published book of poetry reached the public. She then found more success by winning a Pulitzer Prize sixteen years after her first book and publishing four other editions of her poetry books. Her observation of not only self but the work of poets like Whitman, Poe, and Emerson, whom she has kept close to her heart and admired forever, establishes the similarities they share when using language in an obvious way, coming from a place of assurance and complete command while communicating the message with their readers. It is almost like playing a good game of chess with someone, and, of course, always winning them over. Mary Oliver was born on September 10, 1935, in Maple Heights, Ohio. As a teenager, she lived briefly in the home of Edna St. Vincent Millay, where she helped Millay’s family sort through the papers the poet left behind. Her first collection of poems, No Voyage, and Other Poems, was published in 1963. Since then, she has published numerous books, including Blue Horses (Penguin Press, 2014); A Thousand Mornings(Penguin Press, 2012); Swan: Poems and Prose Poems (Beacon Press, 2010); Red Bird (2008); Thirst (2006); Why I Wake Early(2004); Owls and Other Fantasies: Poems and Essays (2003); Winter Hours: Prose, Prose Poems, and Poems (Mariner Books, 1999); West Wind (1997); White Pine (1994); New and Selected Poems (1992), which won the National Book Award; House of Light(1990), which won the Christopher Award and the L. L. Winship/PEN New England Award; and American Primitive (1983), for which she won the Pulitzer Prize. The first part of her book-length poem The Leaf and the Cloud(Da Capo Press, 2000) was selected for inclusion in The Best American Poetry 1999 and the second part, “Work,” was selected for The Best American Poetry 2000. Her books of prose include Long Life: Essays and Other Writings (2004); Rules for the Dance: A Handbook for Writing and Reading Metrical Verse (Mariner Books, 1998); Blue Pastures (1995); and A Poetry Handbook (1994). Oliver held the Catharine Osgood Foster Chair for Distinguished Teaching at Bennington College until 2001. She lived in Provincetown, Massachusetts, for over fifty years, and currently lives on the southeastern coast of Florida.